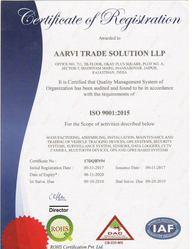 Established in the year 2014 at Jaipur (Rajasthan, India), we “GPSindia (A Product Of Aarvi Trade Solution LLP)”, are devoted towards manufacturing, exporting and importing an outstanding quality range of GPS and Vehicle Tracking System. The offered range is widely installed in vehicles for tracking the position. Thisrange is designed in compliance with innovative technology using quality-assured components at our advanced production unit. Moreover, this range is broadly demanded for its salient features like easy-installation, compact design, accurate functionality, and long service life. In order to achieve maximum client satisfaction we use only best quality components in the production of this range. Furthermore, we have a strict quality check unit which duly tests the offered range against set parameters of quality in order to offer a defect-free range to the clients. Tracking Server and Tracking Application is developed by our expert professionals using pioneer technology and hi-tech devices. This range is widely acknowledged for its bug-free execution, user-friendly interface and platform independence. In addition to this, our clients can avail this range from us at market-leading costs. Furthermore, we also offer qualitative GPS Installation Service. These installation services are imparted by our well-trained staff in accordance with the clients’ specifications and in a well-planned manner in order to achieve the excellent results within the assured budget and time. We manufacture our products under the brand name "UTX". We export our products in Hong Kong, South Africa, Taiwan, China and also import from Hong Kong. Under the leadership of our Mentor “Mr. Falak Agarwal”, we have been able to achieve a noteworthy position in this industry. We have a technologically advance infrastructural unit which is managed by dexterous team of professionals. Our unit along with the support of our team assists us to streamline our production with the large-scale market demands. Moreover, because of our transparent business dealings, quality-centric approach and cost-effectiveness we have become the preferred choice of the clients. We are more than just a dot on map. We provide affordable Vehicle / Personal / Mobile tracking solution. We have carved out a niche for ourselves in this domain owing to our well-constructed infrastructural base that is outfitted with ultra-modern technology. We are able to meet the large scale demands of our product range in the market with the support of our hi-tech base. The infrastructural base comprises of various comprehensive divisions such as administration, production, quality testing, research & development, warehousing, packaging and sales & marketing. All these units are handled by expert professionals who possess widespread experience in their particular field. Additionally, to stay updated with new technology and to boost our production rate we regularly upgrade all the installed machinery at our base.